Have you ever had the roof on your home checked? If you have not, I suggest you do so. Ideally a roof should be checked annually and after every major storm event. Just because you have not seen or had a leak, does not mean there are no problems or potential problems up there. There are several types of roof covering; shingles, tile, and standing seam metal panel are common. 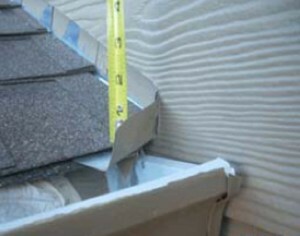 Typically a mixture of asphalt and fiberglass composition shingles are the most common in many midwestern communities. Some are decorative and some are the traditional “3 tab” style. 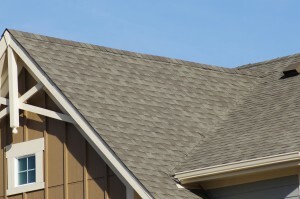 Composition shingles can be damaged by high winds and hail. Growing up in Nebraska, we frequently had hail storms that would damage roofs. Even if you have not had hail or major storm events, like everything else, the shingles age and lose their effectiveness as the sun’s UV deteriorates the shingles. The manufactures may advertise their product as a 20 or 30 year roof shingle. I can tell you that you will be fortunate to get 15 years out of a good shingle roof. Homeowners insurance policies now have specific provisions for roofs so you should check with your agent if you are not aware of those provisions. Otherwise, you could be in for a shock if you ever have a roof claim. Decided to check this yourself? Good. Here is what you can look for and many of these you can fix yourself. Safety first! When using a ladder, make sure it is in good condition. Extend the ladder so the top is extended three feet above the edge of the roof. The base is secure and the ladder at the proper angle. Sealants – any exposed faster heads should have a roof sealant covering them. Roof sealants are available at the hardware or home improvement store. Flashing – typically metal, look to see that they are all secure. Metal flashings occur at the roof to wall joint; sidewall and headwall, drip edge flashing at the roof eave (at the gutter) and possibly on the rake. If you have a fireplace through the roof, metal flashing should be around the base at the roof to wall intersection. 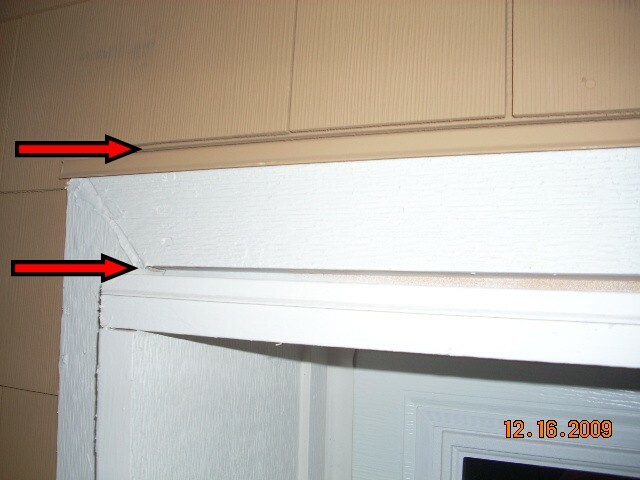 If you have an eave that terminates at a sidewall, there should be a kick out or diverter flashing. See photo at the bottom of this article. 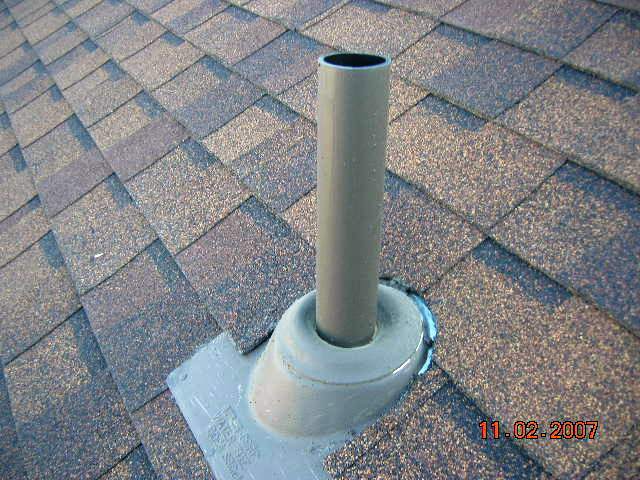 Pipe flashing – Plumbing and mechanical vent pipes that are through the roof should have a metal roof jack flashing installed around it. There will be a rubber boot in the middle of the plumbing flashing where the pipe comes through. 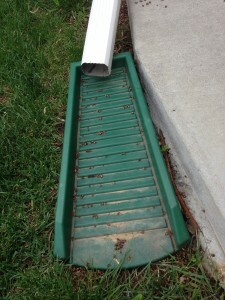 Check to be sure the rubber is in good condition and secure around the pipe. If it is cracked, the rubber not fully extended up around the pipe, or if it looks like it is not properly sealed around the pipe, have it checked by a roof professional as it may need replaced. See photo at the bottom of this article. The mechanical vents will be for your furnace and hot water heater. 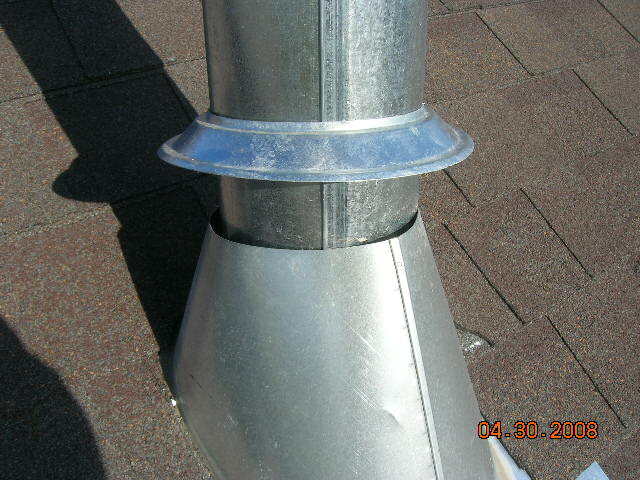 These are typically all metal with a storm collar where the vent pipe meets the roof jack. 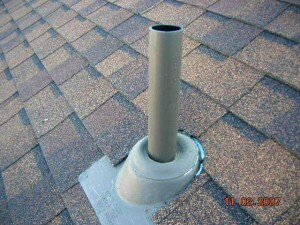 If you have a high efficiency furnace or water heater, the vent pipes may be PVC. Missing shingles – If there are any obvious signs of missing shingles, you will need to contact a roofing professional and have them replaced. The “3 tab” shingles are notorious for getting blown off. Tile and metal standing seam roofs require less maintenance but need to be checked periodically. Walking on the tile roofs can crack the tile and the metal roofs can be slippery to walk on so I recommend these be checked by a professional. 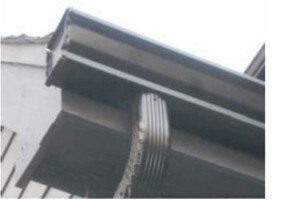 Storm Collar Installation. Metal jack to pipe needs sealed and storm collar lowered to the joint.